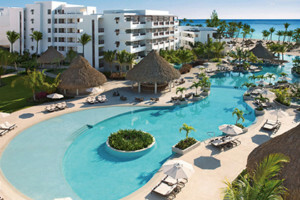 Enter a world of luxury and sophistication at the new Secrets Cap Cana Resort & Spa. Located just 20 minutes from the Punta Cana International Airport, this gorgeous resort boasts 457 beautifully designed suites, a magnificent beachfront, and the perfect setting for couples to rekindle that special romance. With the Unlimited-Luxury® experience, you can enjoy limitless gourmet and a la carte dining (no need to make a reservation), unlimited top-shelf liquor, fruit juices, and soft drinks, 24-hour room service, daily activities, nightly entertainment, and more. Additionally, no wristbands are required throughout the resort! At Secrets Cap Cana Resort & Spa, you’ll have your pick of five a la carte restaurants, a buffet, and a grill. Tempt your taste buds with the seafood options at Oceana, delight in traditional Mexican cuisine at El Patio, or taste French delicacies at Bordeaux. Other mouth-watering a la carte options include Italian and Pan-Asian. After your meal, head to one of six bars and lounges to indulge in a delicious cocktail. Melt away stress at the Secrets Spa by Pevonia®, where you’ll receive decadent treatments, massages, facials, manicures, pedicures, and additional beauty services. Enjoy your services in an outdoor or indoor area, and be sure to take advantage of the sauna, Jacuzzi, steam room, and showers. Whether it be daily activities like snorkeling and sailing, or nightly events like live music and theme parties, there is something for everyone at Secrets Cap Cana Resort & Spa! To Learn More Click the “Secrets Resorts & Spas” Logo.